Why is ICR-SOBA not accredited? One factor in choosing an educational program is the anticipated benefit of its foreseeable outcomes: Will this degree get me a new job? Will this education improve my skills and insights and information base for my present job? At ICR, the SOBA program aims at the latter, equipping already-employed Christian ministry professionals to improve their performances at work. Thus, ICR has prioritized curriculum content and practical ministry needs, rather than adding the expensive costs of academic accreditation politics (which are often emphasized by students seeking entry-level job opportunities). For more information on why ICR has avoided academic accreditation, in order to reduce tuition costs and retain curriculum controls faithful to ICR's founding tenets, see our recognition page. Biblical apologetics start with recognizing and analyzing the perfect revelation record of truth that God has given: Scripture. SOBA promotes the Bible’s authenticity, accuracy, understandability, and authority, even unto every “jot and tittle” (Matthew 5:18). We teach biblical education and apologetics based upon a foundation of divine revelation, and equips the student to minister for God with an eye for eternity, using research and analytical skills, and a wealth of apologetics insights. Our Bible-honoring faculty is committed to the truth of Genesis and agrees with ICR’s biblical tenets regarding the creation account, Adam’s original sin in Eden, and the global Flood. The anti-biblical theory of evolution, as is commonly known, holds a monopoly over discourse in our modern secularized scientific community and in our popular culture. Worse than this, however, is the theological and intellectual compromise within the Church. God has blessed ICR with a worldwide impact since its founding in 1970. In large part because of ICR, there has been a significant revival of belief in creation. Our focus is to equip current and future Christian leaders with practical tools to effectively influence their world with the truths of Scripture. The resident and adjunct faculty of SOBA are all mature Christian leaders committed to the Bible’s teachings, having earned terminal degrees from an impressive variety of competent seminaries, universities, Bible colleges, and liberal arts colleges around the United States. Recognizing the value of practitioner educators, each of our faculty is experienced and actively involved in biblical education, Bible-based apologetics, and/or some other form of practical Christian ministry. We trust that your education at SOBA will lead you to a fruitful and exciting life of service for the God who has revealed Himself through His Creation, His Word, and His Son. Our courses are designed to challenge and motivate men and women toward personal and cultural change. SOBA's mission is to enable students to follow a biblical model for distinctive Christian leadership that demonstrates kingdom living as God-appointed stewards over His creation and seeks to influence all levels of society with a thoroughly biblical belief system. Learn an abundance of evidence of the supernatural and providential workings of our Creator—the “many infallible proofs” of God. Critical thinking and analytical skills are taught, to whet the student’s ability to discern and clarify truth, and to refute criticisms of God’s Word. Enjoy the straightforward way the courses are taught as well as the many insights into applying the concepts to everyday life. The dominant emphasis is comprehension and practical application, not memorizing miscellaneous details or fancy vocabulary. To help defend against detractors of a biblical worldview, we equip our students with sound scientific data regarding origin issues in the physical and biological sciences, and introduce them to hermeneutic skills necessary in supporting the authority of the Bible. Students are introduced to foundational truths and evidences that clearly demonstrate the authority, authenticity, and accuracy of the Scriptures, particularly in light of religious, scientific, and societal norms that conflict with biblical Christianity. Learn, know, personalize, and communicate truth in ways that honor the Lord Jesus Christ. Because SOBA does not accept any government funding, our costs have been kept as low as possible. We hope this will allow as many interested students as possible to participate. Course material is accessed online and through textbooks and DVDs. Our programs are designed for people on the go; the self-paced programs of study can fit into busy schedules. We meet the practical needs of today’s online learner, based upon online education experience acquired by members of that team from other online Christian education programs. As a matter of its institutional discretion, ICR-SOBA recognizes transfer credit for college-level coursework done at other colleges, universities, vocational school, and military training programs. This institutional academic freedom (of ICR’s) is not restricted by academic accreditation politics. The online classroom experience, in a flexible format, facilitates the learning process, and Christian service practicums sharpen practical ministry skills. After more than four decades of ministry, the Institute for Creation Research remains a leader in scientific research within the context of biblical creation. 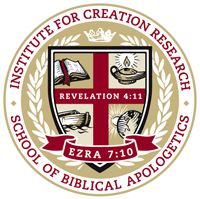 Founded by Dr. Henry Morris in 1970, ICR exists to conduct scientific research within the realms of origins and Earth history and to educate the public in creation science. This education takes place both formally and informally through graduate and professional training programs, conferences and seminars around the country, and through books, magazines, and media presentations. For more on ICR's background, see www.icr.org/who-we-are.